Team USA-1 held onto its lead from day one to emerge victorious from team competition in the Stillpoint Farm CDIO Nations Cup at the Adequan® Global Dressage Festival (AGDF). USA-1 was crowned team gold medalists with an overall score of 423.543. Team USA-1 comprised Adrienne Lyle and Wizard, Silva Martin and Rosa Cha W, Tina Konyot and Calecto V, and Shawna Harding and Rigo. The silver medal went to Canada-1, whose roster included Brittany Fraser and All In, Belinda Trussell with Anton, Chris Von Martels and Zilverstar, and Megan Lane and San D’or. Canada-1 finished second with a final cumulative score of 414.488. Team Spain achieved a podium finish with a team composed of almost entirely small tour horses, earning bronze with a total score of 412.632. Juan Matute Jr. and Don Diego Ymas, Paula Matute and Tarpan Ymas, Carlos Munoz and Klouseau, and Marta Renilla and Presumido competed for Spain. The Stillpoint Farm CDIO Nations Cup competition featured riders from nine teams, including two U.S. teams and two Canadian teams, as well as teams from Germany, the Netherlands, Australia, Colombia, and Spain. There are also individuals participating from Puerto Rico and Georgia. Individual medals will be presented after Friday’s FEI I-1 Freestyle and FEI Grand Prix Freestyle competition, part of the week’s featured “Friday Night Stars” event. AGDF 7 also hosts CDI 3* competition, presented by Peacock Ridge. Between CDIO and CDI 3* competition, 15 countries from around the globe are represented during Week 7 of the AGDF. American Chef d’Equipe Robert Dover said that both USA teams came in to competition to win it and he’s looking forward to continuing to guide American teams to victories at Nations Cups across the globe. “Of course, I came into this with not only the hope, but the expectation, that America would lead. I’m not a good loser at all. I like winning and so when America goes out, no matter where we are in the world, we’re going in to every arena with the idea of winning and of course doing our best. I was very proud of all of our riders, not only on this team but our B team as well. I’m looking forward to the next Nations Cups where America will be representing as well,” Dover commented. Tuny Page of Stillpoint Farm was also on hand to express support for what she believes is the most important competition of the AGDF circuit. 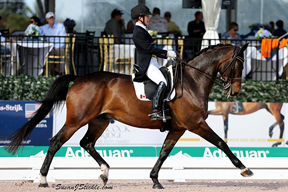 “I think this Nations Cup series is critical to the development of dressage in every country. It’s fantastic to see a team with young people here that probably haven’t ridden on a team before and have the experience of riding on a team. Our young Americans that haven’t ridden on a team before, where else would they get that chance? This has been really critical for the future development for everybody,” she remarked. FEI Director of Dressage Trond Asmyr was thrilled to have the FEI Nations Cup competition in North America and hopes the success of the Stillpoint Farm CDIO Nations Cup will set the precedent for more dressage Nations Cup competitions outside of Europe. President of the Ground Jury Cesar Torrente (COL) was also excited to see the success of the format for Nations Cup competition, which served as a test for the Pan American Games. “First of all, this was such a very interesting experience for the judges. Especially because this is going to be the format for the Pan American Games, so it was a wonderful opportunity to see how it works. I think the judges, as a panel and as a team, agree that it’s going to work,” Torrente explained. Adrienne Lyle was once again the top scoring American rider for USA-1, winning the FEI Grand Prix Special aboard Wizard with a score of 71.059%. Lyle won both of the large tour CDIO classes so far and was thrilled with her first true team experience. “I went to the Olympics as an individual, so yes it was part of a team, but not technically scores counting for anyone else. I thought what a blast, what a fun atmosphere. Like Juan (Matute, Jr.) said, not just for our own country, but for other countries, to have the atmosphere and support of everyone there. It was a fun pressure of ‘Come on, let’s do this for each other! '” Lyle beamed. “[Canada has] just a great group of people around us and it’s true, Canadians are really supportive of each other. With Desi [Dillingham, Special Advisor to Team Canada], and [Dr.] Volker [Moritz, Technical Advisor to High Performance], Liz [Steacie] as our Chef [D’Equipe], it’s just been a great experience and we all just stand by each other. I just want to thank everybody, the sponsors and the organizers, for putting this wonderful show on,” Trussell expressed. Team Spain had only having one large tour horse on their team, but still fought their way to the podium for the bronze medal finish. “Just being here next to these amazing riders is already a dream. To be sharing a podium and look to the left and see all of these people is just incredible. I remember when I was a little, I would look up to them and watch videos and say ‘I want to be like them.’ It’s just incredible. I have no words,” Paula Matute expressed. Paula Matute’s brother, Juan Matute Jr., was the high scoring Spanish rider, placing second in the FEI Intermediaire-1 in with a score of 70.569%. After winning the FEI Prix St. Georges on Thursday, his scores were a significant contribution to Spain’s medal, but Matute Jr. isn’t one to let that get to his head. “It feels great [to contribute such high scores]. I think we all did a great job on the team. We all played our part for the CDIO competition. My score is just one more score for the team, it’s no better or worse. It’s just one more score that adds up to the total,” Matute described. Matute was finally edged out in the FEI Intermediaire-1, after being on an impressive run in the last several CDI competitions. Leida Collins-Strijk broke the teenage sensation’s winning streak earlier on Friday with West Side. The pair had the highest score of 72.158%. “I think [the I-1 test] was better than yesterday on the small things. I looked a lot at the video yesterday and I think, ‘Okay, I like the ‘wow’ factor, but sometimes here I like more [the smoother ride].’ That’s why I try to make it a little bit more smooth and nice. The horse has been a little bit [unsettled by the International Arena], but now he’s relaxed and I can ride him now so we can put more little points in,” Collins-Strijk described. “It all worked out. And I was like, ‘I really want to beat Juan! '” she laughed.